One of the most beloved times of the year is now upon us. It’s FINALLY the season for College Basketball Playoffs! For almost a month, men & women from every state gather to cheer on their favorite team. Off The Strip Bar & Bistro is really no different. Due to the fact that we are located in Las Vegas, we take this month very seriously! Gather your friends, family, or rivals & join us at OTS for the BEST in March Madness festivities. If you love college basketball, stop by and watch the games. We’ll have food, drinks, great games, and incredible specials. Bring in your sports bets & receive Buy 1 Get 1 draft beers! 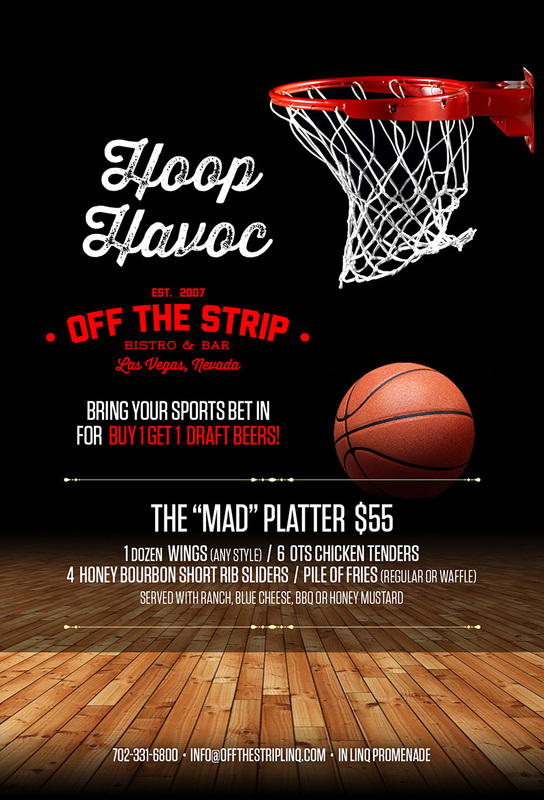 $55 MAD Platter includes all of your basketball favorites!